I shot this as part of a puff pastry and phyllo dough story. This is such a delicious, easy apple dumpling that you can bake while you are having dinner and have it fresh and hot for dessert. Or, if you are feeling particularly decadent, have it for breakfast with some hot coffee or tea - it would be a wonderful weekend treat. Preheat oven to 400 degrees F. Combine apple, sugar, cinnamon and nuts. Lay phyllo sheet on counter, short side facing you. Brush with butter and dust lightly with granulated sugar. Place ½ apple mixture on phyllo about 2 inches from edge closest to you. Spread evenly across dough leaving 1 inch on both sides. Fold sides of dough in over mixture and roll dough away from you creating cigar-like roll filled with dough. Do not roll too tightly or dough will tear. Place seam-side down on a non-stick baking sheet, brush with butter and sprinkle with sanding sugar. Repeat with remaining filling. Bake for 10-15 minutes or until phyllo dough is golden. Allow to cool slightly and then cut rolls into slices of desired length. Lovely recipe, beautifil photo - Bravissima! Never used phyllo dough but just bought a fersh one and was searching for a recepe..Found it!!! This reminds me of apple strudel from Austria. It would be great mixed with vanilla icecream. Have you tried it? Can you believe I haven't made a single apple dessert this fall. I eat an apple every day. Surely a few of these apples should make it into some lovely pastry. Thanks for a nice recipe and beautiful (as always) picture. I would like to eat it very soon. By which I mean I would like for you to make it again soon. It looks absolutely delicious. I will help if you would consider making it again. I love the versatility of phyllo dough...and its ease of use. This looks scrumptious...perfect with a scoop of vanilla ice cream! 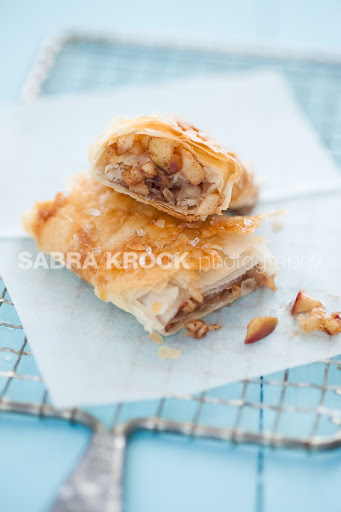 I love the crunchy phyllo with the soft, sweet apples as well as the beautiful photo. I have a weakness for all kinds of apple desserts. I'd love to try this one! Sabra, you have an absolutely beautiful blog and a great eye for a good food shot. Thank you for sharing this decadent apple dessert, and all of those great tips, too. Have a wonderful weekend! i adore your photography. i have a canon powershot which is...shot. it is ridiculous. hope to one day get a real camera. and i have 2 kids and a baby over 2 weeks old ;) so i don't have much time for staging food. anyway, your pics are inspired and i love that you use so much blue for your background and props. i have read places that blue has no place around food/kitchens bc there is no food that is naturally blue. but the sky is blue and beautiful and your pictures are light and airy...you can make the most fattening of foods seem....good for me!